Some painful eyes are best examined after local anaesthetic eye drops are administered. Others patients require sedation due to the sensitivity of the eye or the patient is unhappy to keep their head still e.g. puppies or kittens. In house tenometry (measurement of the pressure within the eyeball (intraocular pressure)) and other advanced diagnostic aids, provide a good basis for therapy. The follow up of glaucoma cases (increased intraocular pressure) requires regular measurements to monitor the success of treatment. We can perform such rechecks in house. Small dogs are often great friends with big dogs. Arguments over bones however can be costly! Just one quick nip can "pop" out an eyeball. Please take care when feeding. 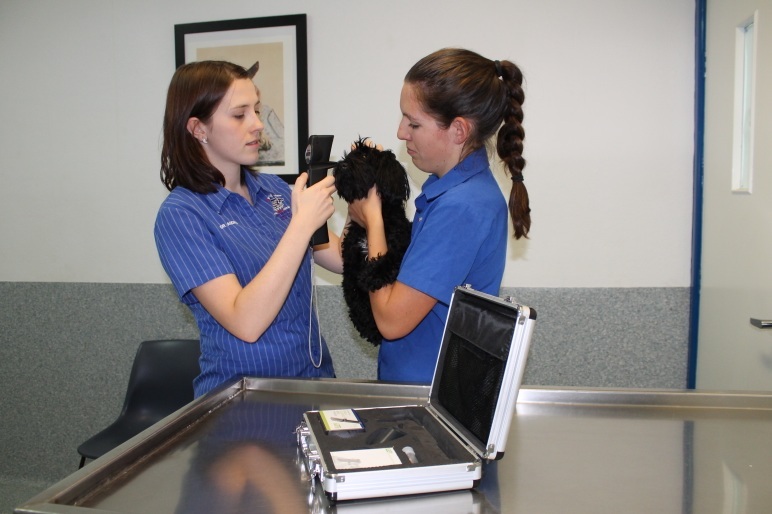 This is Dr. Audrey and Nurse Emily using the tenometer, testing the intraocular pressure in a dog. A monthly visit (usually the first Wednesday of every month) by a registered specialist in opthalmology to Orange provides us with convenient options for referral cases. We are also able to refer cases to registered specialists in Sydney at any time.